MAKING OF A GARDEN BLOG PART.2. 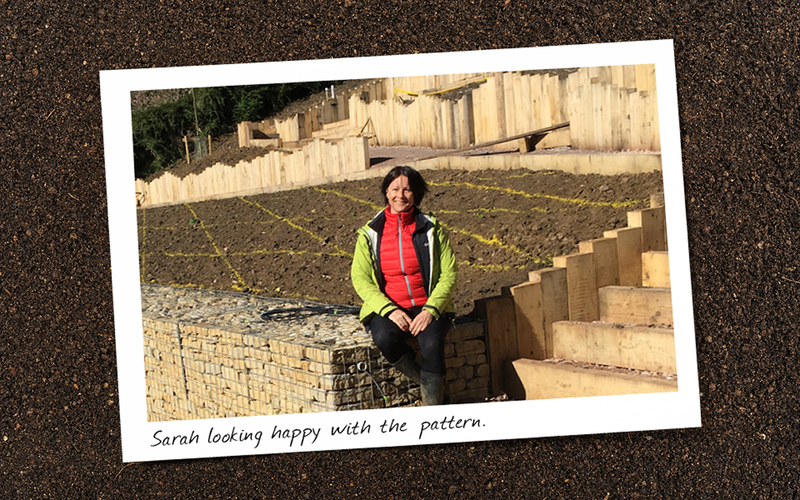 The transformation of a garden from paper plan to reality often exceeds expectations. Occasionally it more than exceeds expectations. South Hayes is one of those. When I returned to it in June following planting in March I was amazed at how well the little P9 plants had come on. 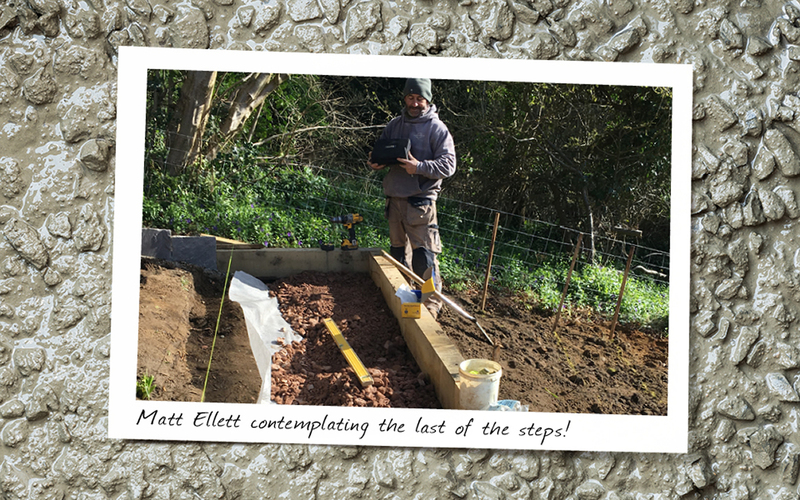 Following months of hard toil by Matt Ellett and his boys, cutting and carefully placing 420 oak sleepers (approx. 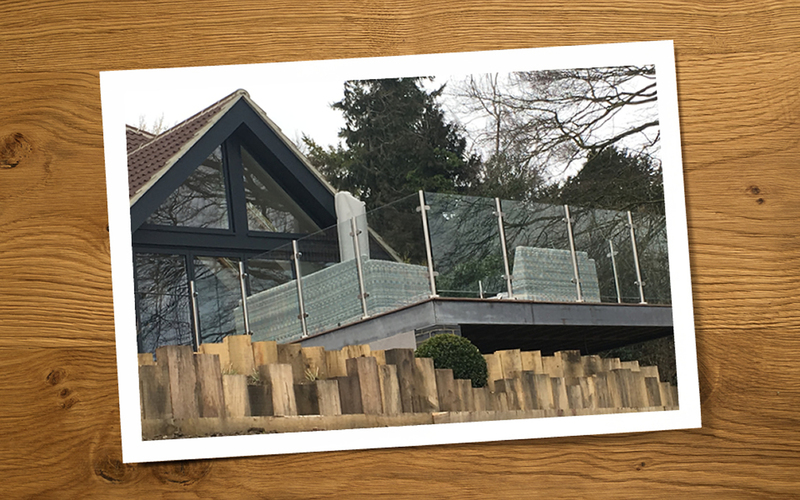 23 tons) on their ends to create the terracing, zig zag paths and planting beds, the oak had started to grey and blend beautifully with the gravel paths and render of the top terrace. In fact it took 25 tons of concrete for the footings, 35 tons of Mot Type.1. 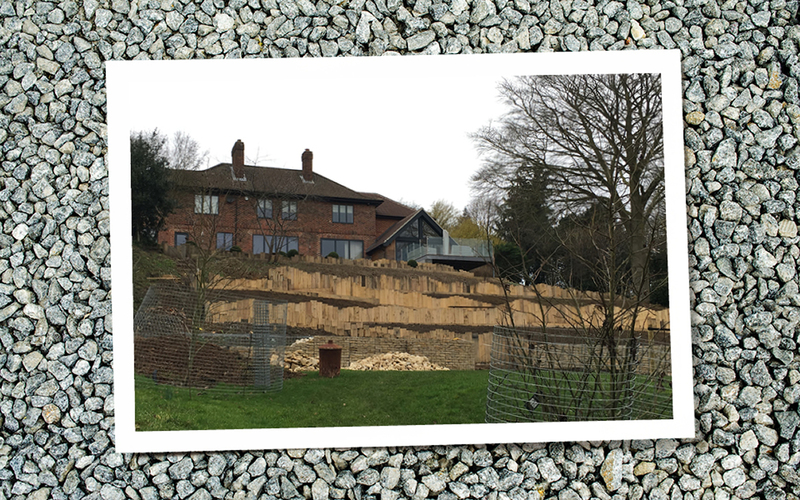 for path construction, 15 tons of gravel for the dressing of the paths and 43 tons of stone for filling the gabions. Most of which had to be barrowed by hand as the slope was so steep and slippery that the digger could not cope. No wonder the boys looked exhausted at the end of each day! Planting was also a complicated process. The complex plan designed in overlapping diamonds needed to be sprayed onto the prepared soil. Transferring the 2D plan onto 3D sloping beds was easier said than done, but we got there in the end ! 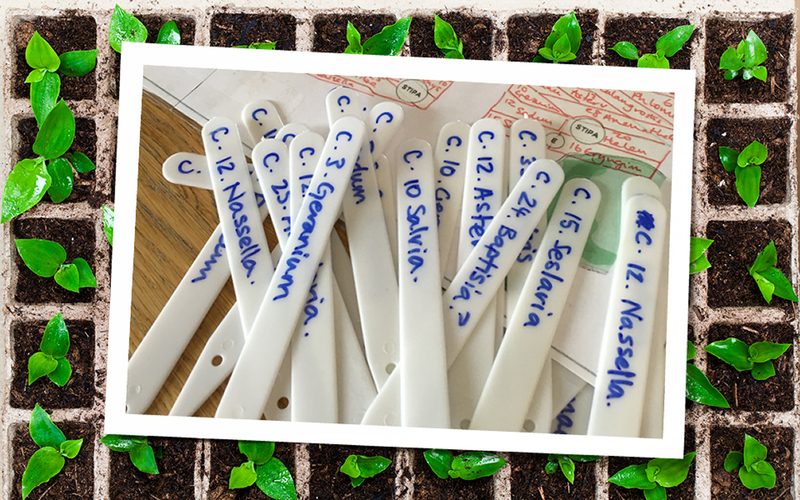 With the imminent arrival of over 2000 plants each bed was given a letter and plants allocated according to the plan. This made organisation a lot easier. All overseen by my 87year old Dad and lots of cuppas! 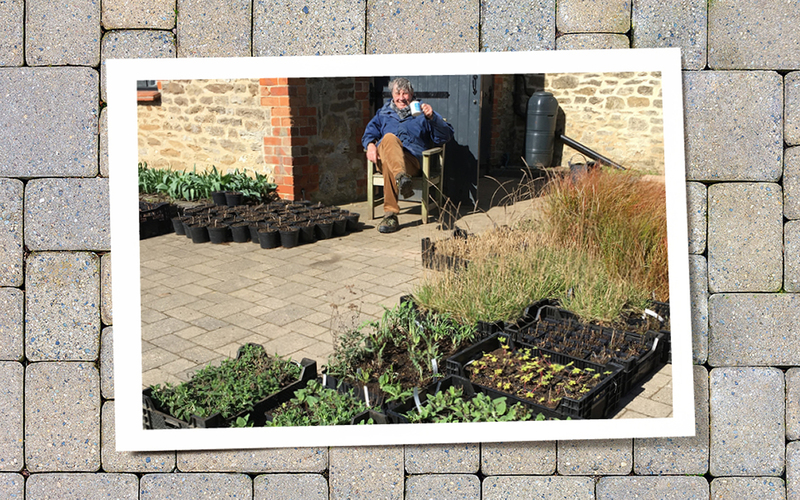 The plants were supplied by Chris Marchant at Orchard Dene, mostly in P9 sizes, which is the smallest pot size. 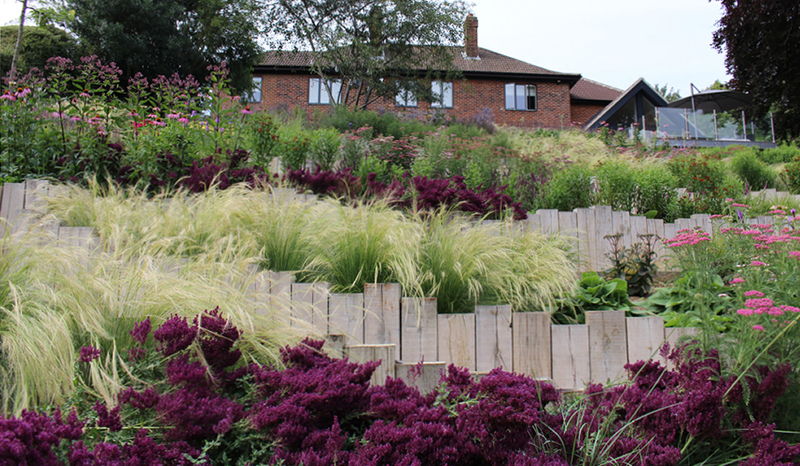 This does mean that the initial planting can look very sparse and weeding will be the main chore as well as keeping them watered, but planting in the Autumn or early spring means they grow quickly, so it is not worth the extra expense of larger plants. It took us three days to set out the plants. 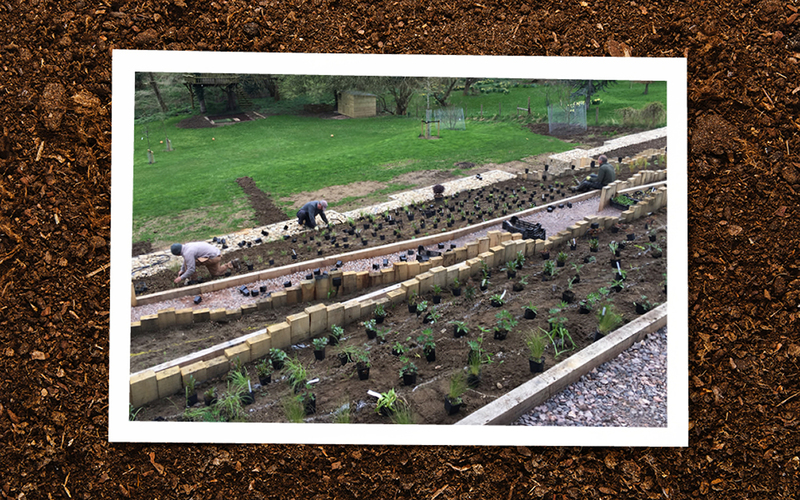 Followed closely by the boys, planting at a rate of about 200 plants a day, we got it all done and dusted efficiently.